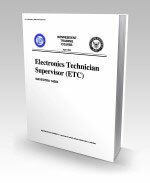 14084.pdf - Pages: 196 - 14084 Electronics Technician Supervisor (ETC) - Provides information on ET responsibilities; organization and administration of the electronics division; training of division personnel; quality assurance; test equipment management and administration; EMI; and supply. 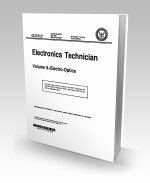 14085.pdf - Pages: 194 - 14085 Electronics Technician Supervisor (ET1) - Provides information on the ET responsibilities; supervision practices; combat systems organization; NTDS/WDS and combat systems testing; electronics casualty control and reporting; calibration and stowage; electronic test equipment; 2M; and system/test equipment maintenance. 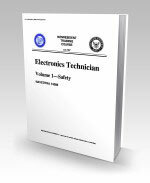 14086.pdf - Pages: 58 - 14086 Electronics Technician, Volume 1, Safety - This is the first volume in the ET Training Series. Covers causes and prevention of mishaps, handling of hazardous materials; identifies the effects of electrical shock; purpose of the tag-out bill and personnel responsibilities, documents, and procedures associated with tag out; and identifies primary safety equipment associated with ET work. 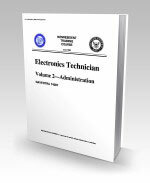 14087.pdf - Pages: 70 - 14087 Electronics Technician, Volume 2, Administration - Provides an overview of general and technical administration and logistics. Included are descriptions of forms and procedures included in the Maintenance Data System (MDS) and publications that should be included in a ship's technical library. Also included is a basic description of the Naval Supply System and COSAL. 14088.pdf - Pages: 214 - 14088 Electronics Technician, Volume 3, Communication Systems - Provides operations-related information on Navy communications systems including SAS, TEMPEST, satellite communications, Links 11, 4-A, and 16, the C2P system, and a basic introduction to local area networks (LANs). 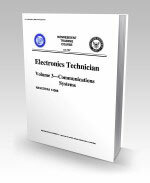 14089.pdf - Pages: 86 - 14089 Electronics Technician, Volume 4, Radar Systems - Provides a basic introduction to air search, surface search, ground-controlled approach, and carrier controlled approach RADAR systems. Included are basic terms associated with RADAR systems, descriptions of equipment that compose the common systems, descriptions of RADAR interfacing procedures and equipment, and primary radar safety topics. 14090.pdf - Pages: 56 - 14090 Electronics Technician, Volume 5, Navigation Systems - Introduces the primary navigation systems used by U.S. Navy surface vessels. It provides a basic introduction to and explanation of the Ship's Inertial Navigation System (SINS), the U.S. Navy Navigation Satellite System (NNSS), and the NAVSTAR Global Positioning System (GPS) and associated equipment. It then provides an introduction to and explanation of the Tactical Air Navigation system (TACAN) and its associated equipment. The information provided is written at an introductory level and is not intended to be used by technicians for diagnoses or repairs. 14091.pdf - Pages: 522 - 14091 Electronics Technician, Volume 6, Digital Data Systems - Covers the following subject matter on computers and peripherals: fundamentals and operations, configurations and hardware, operator controls and controlling units, components and circuits, central processing units and buses, memories, input/output and interfacing, instructions and man/machine interfaces, magnetic tape storage, magnetic disk storage, CD-ROM storage, printers, data conversion devices and switchboards. 14092.pdf - Pages: 124 - 14092 Electronics Technician, Volume 7, Antennas and Wave Propagation - Covers a basic introduction to antennas and wave propagation. It includes discussions about the effects of the atmosphere on rf communications, the various types of communications and radar antennas in use today, and a basic discussion of transmission lines and waveguide theory. 14093.pdf - Pages: 118 - 14093 Electronics Technician, Volume 8, Support Systems - Provides a basic introduction to support systems: liquid cooling, dry air, ac power distribution, ship's input, and information transfer. It includes discussions on configuration, operation and maintenance of these systems.